"Panang curry with chicken represents the diversity of Thailand's southern region. Panang refers to the island of Penang in Northern Malaysia bordering southern Thailand. Use 4 tablespoons curry paste from a fresh curry paste recipe or 5 tablespoons pre-made curry paste if time does not permit making your own paste"
Fry the curry paste in the oil in a large skillet or wok over medium heat until fragrant. Stir the coconut milk into the curry paste and bring to a boil. Add the chicken; cook and stir until the chicken is nearly cooked through, 10 to 15 minutes. Stir the palm sugar, fish sauce, and lime leaves into the mixture; simmer together for 5 minutes. Taste and adjust the saltiness by adding more fish sauce if necessary. Garnish with sliced red chile peppers and Thai basil leaves to serve. 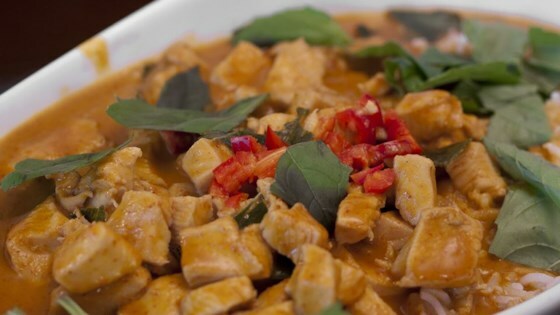 See how to make authentic southern Thai-style chicken curry. For us it was way too hot! I wish I had read more reviews before making i. This is awesome! Just like the restaurants! I added a bunch of slightly grilled bell peppers to the curry and it was a full meal!